Junior dos Santos returns to action this weekend in the main event of UFC Fight Night 86 against the surprisingly surging Ben Rothwell. After beginning his career with a 15-1 record and a UFC title, Dos Santos has lost three of his last five. Obviously the losses have hurt his ranking. However, the degree of his decline is staggering. The following chart shows Dos Santos’ rankings points from the Quarterly Generated Historical Rankings for every quarter since his peak ranking from Oct. 1, 2012. As you can see, even though he currently sits at No. 7 in the heavyweight division, his decline in terms of ranking points is drastic. How does this decline compare to other UFC fighters in the division? To measure Rankings Momentum, that is decline or improvement, let’s first chart quarterly rankings points from Oct. 1, 2012 to Jan. 1, 2016 for all 16 fighters currently listed in the UFC’s heavyweight rankings, then perform a linear regression. This process will find the best fitting straight line also known as a regression line (illustrated above in orange). 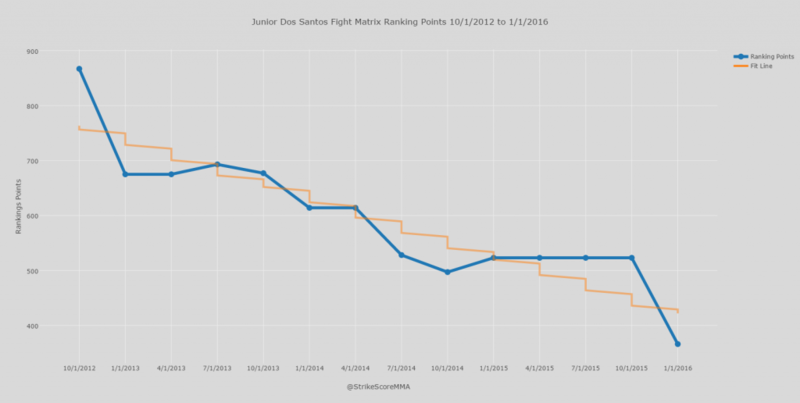 Since the slope of this regression line will represent the rate of change in ranking points as time changes, fighters with positive numbers will be seen as improving while fighters with negative numbers will be on the decline. As you can see, Dos Santos comes in dead last in terms of Rankings Momentum among the 16 fighters currently in the UFC rankings. Dos Santos’ decline is also noticeable in terms of his striking performance. As a respected boxer, he has always relied on his stand-up game to carry him to victories. However, his average StrikeScore per year has declined steadily over the last five years. (StrikeScore is a proprietary stat that measures striking efficiency.) This is partially due to the fact that he has faced better competition as he has progressed through the UFC ranks. However, his last three fights have been three of the four lowest scored striking performances of his career. In order to get back on track this Sunday, Dos Santos will need to reverse his negative momentum. That might not be an easy task considering Rothwell is coming off three straight upset victories and has more than doubled his rankings points since 2012.